A little while ago I was driving through Venice (California) and noticed a surf shop that must have recently gotten broken into. To me these 4 simple words so masterfully describe how we help our clients derive their company’s true soul. What we are really doing is determining the ‘vibe’. A vibe that you can fully embody and that others can fully embrace. A vibe that one day turns into your norm and that you spread with ease. A vibe that if competitors come in, they can no longer simply steal. That vibe is how Keith Moon played the drums or how Craig Kelly surfed the snow. There have been plenty of amazing drummers and snowboarders, but they can’t touch that style, that vibe. How poppin makes receiving a stapler in the mail exciting? It’s their vibe. That vibe is the foundation to their brand. 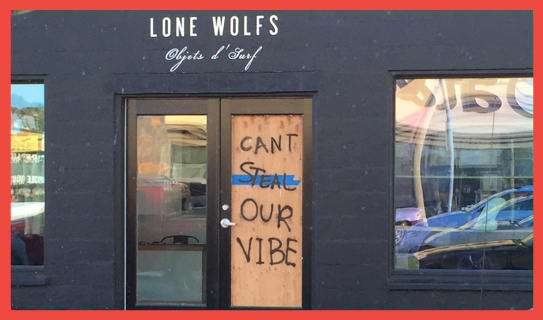 “Can’t Steal Our Vibe.” Street culture poetry that every company transitioning into a brand can learn from. If all fails, if all gets stolen, what does your brand still own? What is that foundation that you can rebuild upon with ease, because it is based on passion and emotions and not products and numbers?